This post is sponsored by Sea Cuisine. All opinions are my own. 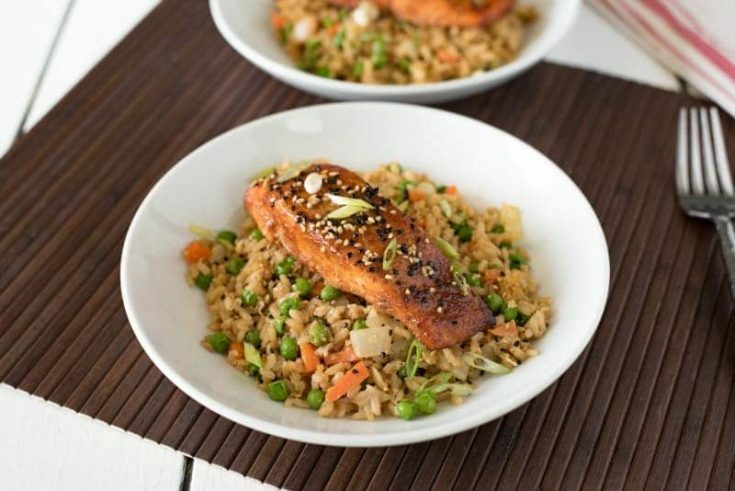 Asian Rub Grilled Salmon Fried Rice Bowl is an easy lunch or light dinner. 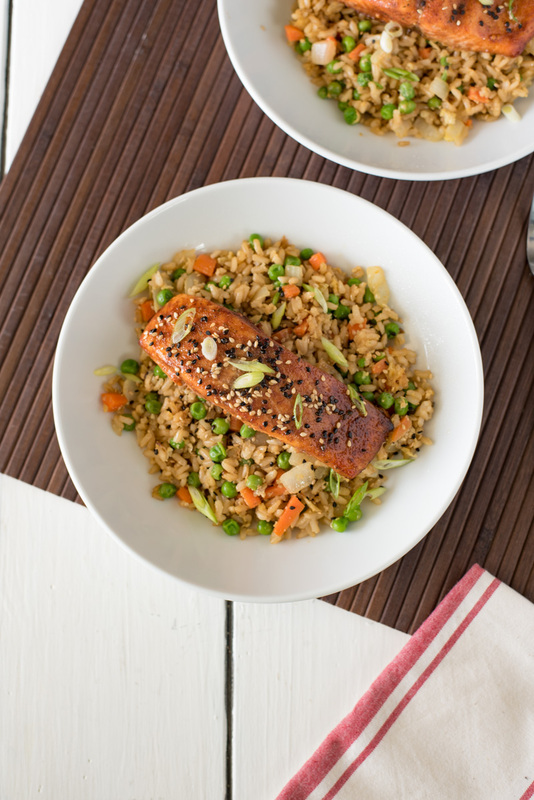 Leftover rice is transformed into vegetable fried rice and topped with Sea Cuisine® Asian grill rubbed salmon. An easy meal ready in 25 minutes. I’m excited to be featuring another delicious seafood product from Sea Cuisine®. Their from freezer to oven, expertly prepared seafood is the best I have ever tried. This time around I sampled their Asian grill rubbed salmon that is flavored with a rub of chiles, mustard seed, parsley and spices for a perfectly balances flavorful fillet. Since both my husband and I work from home, it’s really convenient when I’m making something for the blog that we can take from the photo shoot and eat as quick lunch before we both get back to work. Just like the lemon pepper scallops with sautéed squash I featured a couple of weeks ago, the side (in this case the fried rice) I prepare while the salmon roasts in the oven. I had leftover brown rice from the day before and added to a pan of sautéed onions, carrots, peas and egg. 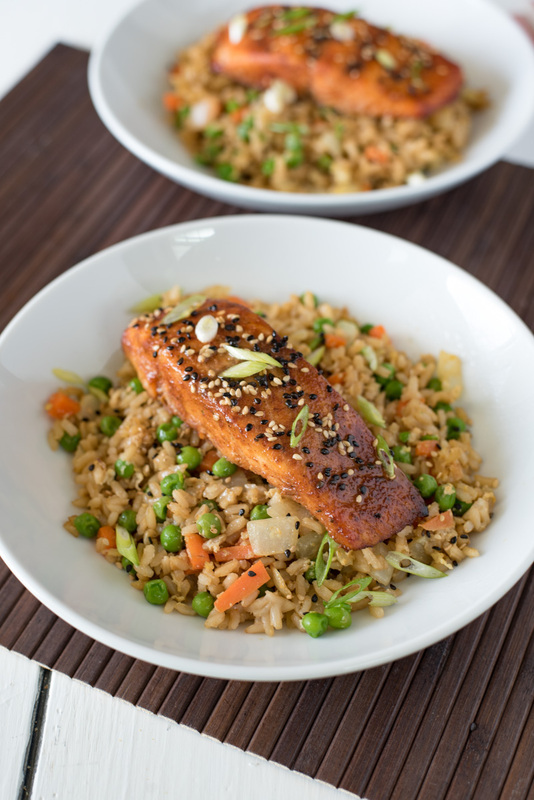 A simple sauce of soy sauce, toasted sesame oil, fresh ginger and honey adds a wonderful umami to the rice and what you get is the easiest, fried rice and side that complements the salmon perfectly. For a little finishing touch, I added toasted sesame seeds and chopped scallion to the top of the finished dish. The perfect lunch or dinner for two. Asian grill rubbed salmon fried rice bowl is an easy lunch or light dinner. 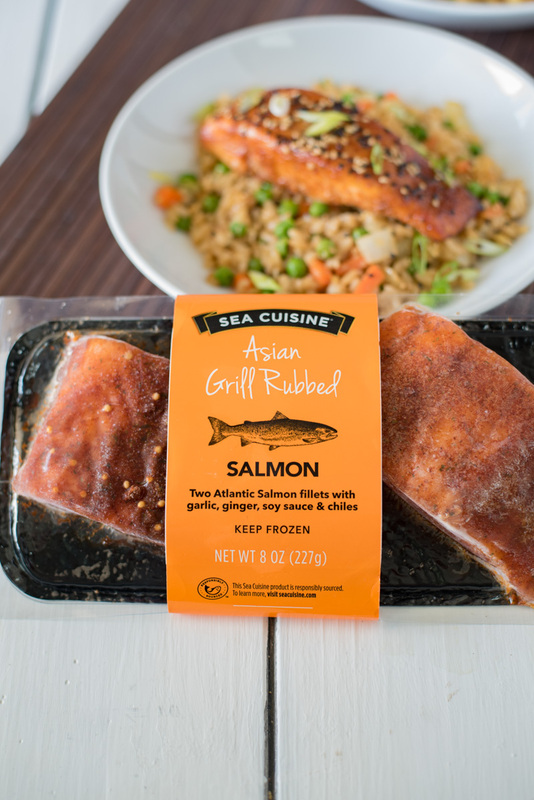 Leftover rice is transformed into vegetable fried rice and topped with Sea Cuisine® Asian grill rubbed salmon. An easy meal ready in 25 minutes. Add the soy sauce, sesame oil, ginger and honey to a bowl, whisk to combine and set aside. Preheat oven to 400°F. Add salmon to a baking sheet and bake for 22-24 minutes. While the salmon cooks, make the rice. To a sauté pan add the oil over medium heat. When hot, add the onions and cook until translucent, about 5 minutes. Add the peas, carrots and egg. Stir to scramble the egg. Stir in the cooked rice and add the sauce, mixing well. Divide the rice between 2 bowls and top with the cooked salmon filets. Garnish with sliced avocado and green onions. I just saw Sea Cuisine is now in my grocery store. I’m going back to buy this salmon and make this dish. 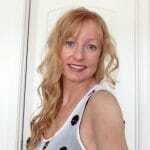 Lovely easy recipe, Janette. Fried rice is one of those things that I always mean to try making and never do. I really should just go for it soon, and when I do I’ll pop back here and use your recipe!